You can’t manage what you can’t measure, and RecruitBPM’s standard reports help agency leaders measure what’s working and identify problematic bottlenecks before they result in lost revenue. Standard reports include Team and Individual User activity reports, Job Order, Candidates-specific activity reports, and more. Inside each report is Date/time and User filters for customize selection. 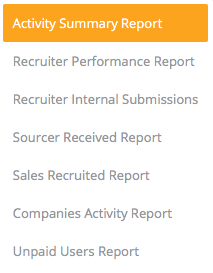 Export button on the top right corner in each report lets you export the report data into an excel spreadsheet.